Have you chosen a word of the year yet? If not and the thought of this intrigues you, you’ll love today’s post! Shawna joined us at the Conference in Spring of 2018 and it has been incredible to witness her growth in the last year alone. Today, she is on the blog sharing how to choose a word of the year, examples of a few she has lettered for people if you are looking for inspiration, and products that she has available in her shop for you to purchase as well. Enjoy! Hi Friends! My name is Shawna Clingerman and I’m so excited to share with you about one of my favorite annual projects ever - my Handlettered Word of the Year Project. I am among the zillions of people out there that have hopped on the “Word of the Year” train over here. Also referred to “One Little Word” or a “Focus Word”, choosing a word of the year can be a fun twist on the idea of New Year’s resolutions! Personally, I am on year five of choosing a word of the year: Begin (2015), Bloom (2016), Embrace (2017), Fearless (2018), and for 2019 my word is Chosen! Choosing a word of the year has really been such a powerful practice for me. I’m not overstating things when I say that it has been really life-changing. Having a word to focus on and challenge yourself with for an entire year gives you so much opportunity to move away from the “pass/fail” sense of resolutions and instead it is the kind of concept that can evolve with you. When I started my year of “fearless”, for example, I had one meaning in mind. But as I welcomed that word into my life and thought about what it would mean to be unafraid in every circumstance I faced - it allowed me to never feel de-railed in my goals. If you allow it, your word can work it’s way into any stage of life, into any challenge, and into every opportunity as well! This idea was born in the end of 2017, when a brilliant business friend of mine (SEO superhero, Meg of Megabolt Digital) messaged me with the most awesome exciting idea EVER. Both her and I, were really into the concept of choosing a word of the year AND I had been seeing a lot of traction on my social media when I shared iPad lettering videos… So she encouraged me to ask for submissions and letter other people’s words of the year for them! I got SUPER excited about the concept and jumped right in! It was an absolute success in 2018. I lettered over 70 words and the response and engagement was out of this world! It was so incredible!! What I loved most about this project it is that it gave me the opportunity to do what I love the very most: to connect with with people. I got to hear what was on people’s hearts, to share their stories, to connect with others and to watch people connect with each other over their words too! I love love love the way when we share with each other with honesty and vulnerability we discover just how connected we all are. We truly are not alone in our challenges, and we are ALSO not alone in our dreams! This year once again my Handlettered Word of the Year Project is going strong! Daily, I am sharing a video on social media of myself hand-lettering someone’s word of the year. I refined my process a little this year with a landing page and a google doc to keep everything easier to schedule. Here are some examples, where you can see exactly what I mean - it is so so amazing to see into people’s hearts as they open up! “I chose this word because of my father. He passed April of this year and “intentional” pretty much sums up his life through his actions and what he asked of me almost daily. So, I’m charged with making more intentional moves- intentional in my thoughts and decisions, intentional in the relationships I foster, intentional with my time and intentional in business practices. ”I chose fight as my word of 2019 because I know that that's what I need to do in the upcoming year; I need to fight. I need to fight for myself, for my mental wellness and continued recovery from C-PTSD and depression. I need to fight past my defenses so that I can make progress in therapy. I need to fight through my anxiety and do the things that I know will help me. I need to fight and I need to fight myself for myself. It's hard when the thing you have to go to battle with is your own mind. It can be confusing and you can sometimes be uncertain as to which way is up and which is down. I didn’t have an easy childhood and half of my adult life was not any better, so fully opening my heart to faith was not easy and is still difficult at times. I am learning that when HE is speaking to me, I need to listen…LOUD AND CLEAR! Whatever that plan might be and however crazy it might feel at times, I need to have faith in HIM." You can see SO many more of these over on my Instagram feed too! Check out the hashtag #handletteredwordoftheyear to see alllllll of the videos I’ve done so far! After the words go live, they are ALSO available in my Etsy Shop as a digital download and/or as a really amazing personalized product to keep your word nearby. You can get your word on a mug, on a notebook or as a foil print! 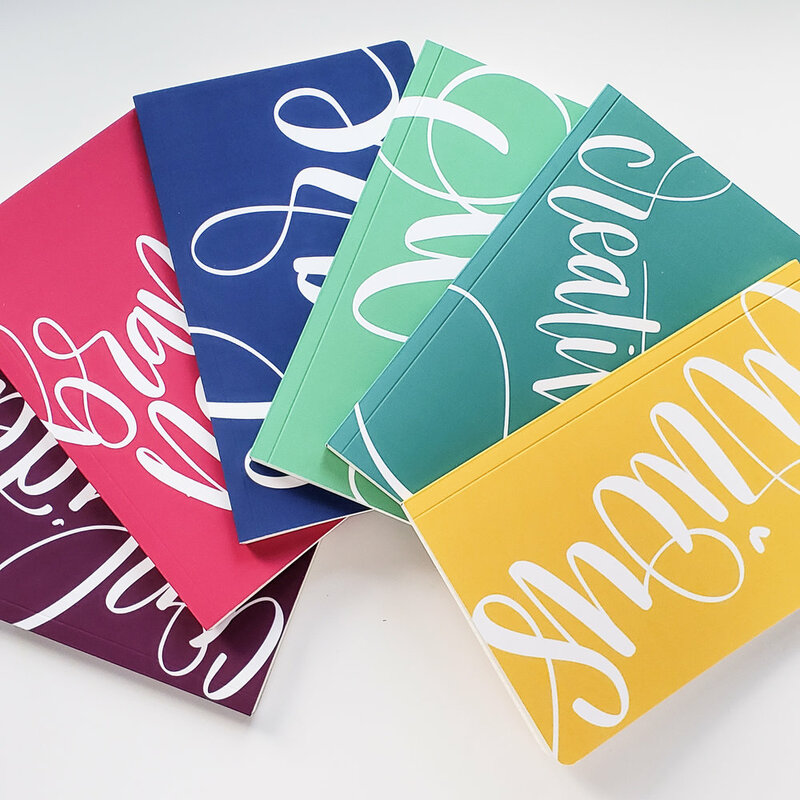 My Word of the Year Notebooks come in a fun variety of color options, 2 different sizes, and they are an amazing luxury matte texture that I’m kinda obsessed with! The first page also has a really powerful word of the year statement piece, where you get to sign your name right below your word of the year. Plus, you get to choose if you want your book filled with a dot grid, a graph paper, ruled lines, or if you would like it to be to have blank sheets! You can also pick up your word of the year as a Mug or as a Foil Print. I currently have 108 different words listed in my Etsy shop as digital downloads and that number is still growing! The easiest way to see if your word is up is to go to my Word of the Year Page and look for your word in the alphabetized list at the bottom of the page. Each word is linked so you can simply click on the word to go pick it up in the shop. OR, if your word isn’t yet listed, you can get any custom word as a digital printable download right here! I can’t even tell you how meaningful this project is to me, and how much I recommend you choose a word for yourself and then find ways to engrain it into your life!! It may be the end of January but it is seriously NEVER too late to pick a word and I will tell you right now the practice of focusing on each of those words brought me to – well, RIGHT NOW! I still carry with me the things I learned each year… it is a beautiful thing. Every year and every word has empowered me for the next. They all have become friends to me, I really can’t imagine entering a future year without picking a new word to focus on! If you are feeling intimidated about picking a word of the year, you may find this article + worksheet on my website useful. Don’t let perfectionism hold you back. This isn’t a contest, your word does not have to be the most one-of-a-kind, unique word. There is no time limit, there is no reason to give yourself a hard time for not being where ever it is you think everyone else is at! The word of the year journey, just like anything else, is not about fitting someone else’s timeline - it's not about getting to some pre-defined end… it's about the journey itself, it is about being where YOU are already at and choosing what is on your own heart. I am a freelance graphic artist, hand-letterer, and illustrator with a passion for finding that place where art meets heart! I love people. I love drawing on my iPad. I love watercolor lettering. I’ve done work with lots of awesome brands, including: Becky Higgins and American Crafts, Photo Play Paper, Illustrated Faith, Catherine Pooler Designs, Paper House Productions, and more! I have been in the business of making art for sale in one way or another for over a dozen years. I attended the Spring 2018 Creative Founders Conference as part of my FEARLESS 2018 and it empowered me SO much, to embrace my strengths, and be myself in my business! Since attending I’ve started taking my business more seriously, and reaching for those bigger goals that I always thought I couldn’t let myself dream of. I’ve grown in confidence, in income, and (maybe most importantly) in my sense of WHO I AM in this wonderful universe of creative business owners!